(KGTV) - The Pittsburgh Police Department is investigating a fight that broke out in the stands towards the end of Sunday's Chargers-Steelers game. 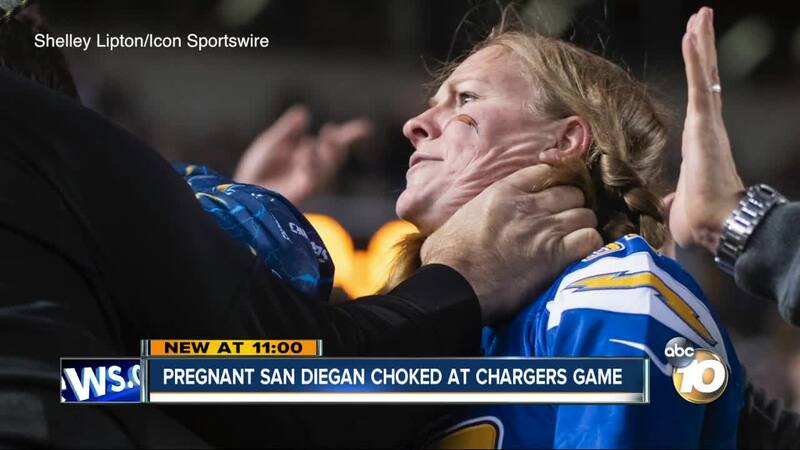 Video shows an unidentified Steelers fan fighting with two Chargers fans, identified as Daniel Minshew and his six-months-pregnant wife Donna Bryan. Minshew and Bryan, who are from San Diego, had flown out to Pittsburgh to watch the game. The fight broke out for unknown reasons with only a few seconds left in the game, which the Charges ended up winning 33-30. Minshew said before the fight, a Steelers fan had yelled at them to sit down. At one point during the altercation, video shows the Steelers fan’s hand around Bryan’s neck, appearing to choke her. Minshew then intervenes to defend his wife. “That video that has gone viral did not pick up the initial attack where I was blindsided from behind,” Minshew said. Aside from some bruising, Bryan said she and her unborn child are OK.
Bryan and Minshew said they plan on consulting with a lawyer.